Looking for a pretty indoor plant to brighten up a window sill or table? 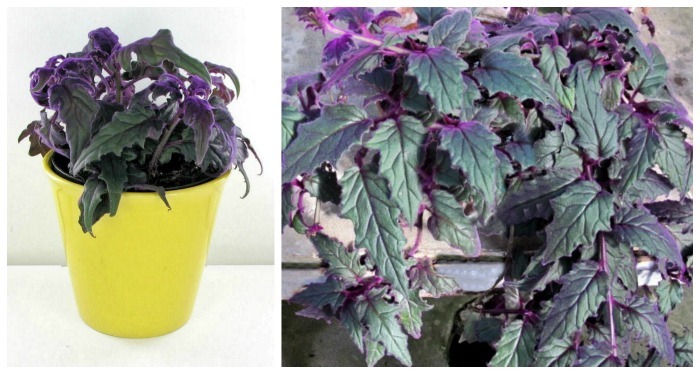 Try this purple passion plant – gynura aurantiaca. 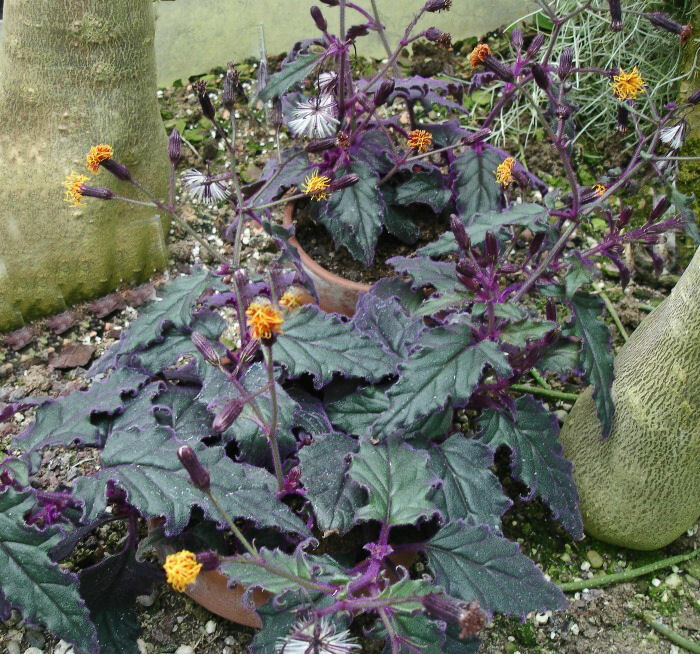 This distinctive plant has velvety leaves with slightly raised hairs on greenish purple stems. Gynura aurantiaca is native to Java and is fairly easy to grow if you have a brightly lit room. This lovely tropical indoor plant is relatively easy to grow. It only needs moderate light conditions and not too much water so this makes it ideal for beginning gardeners. Give the plant medium filtered light. A sunny north facing window sill works well. It also will grow under grow lights in a darker room. If you give the plant too much light the foliage will scorch and too little little will give you a weak plant that becomes leggy as it stretches to the light. If your window faces south, where the light is stronger, a sheer curtain will keep the light from scorching the leaves. Water when the plant feels dry about an inch into the soil. The plant likes fairly even moisture but not soggy soil. The plant is susceptible to root rot, so be careful not to over-water. Gynura Aurantiaca is a fast growing plant with an upright growth habit when young. As the plant matures, it takes on a more sprawling habit. It can grow to 1-2 feet. Trim the growing tips (you can use them for cuttings) to make the plant keep a bushy shape. Small plants will grow better when kept slightly root bound. This also controls its size a bit. 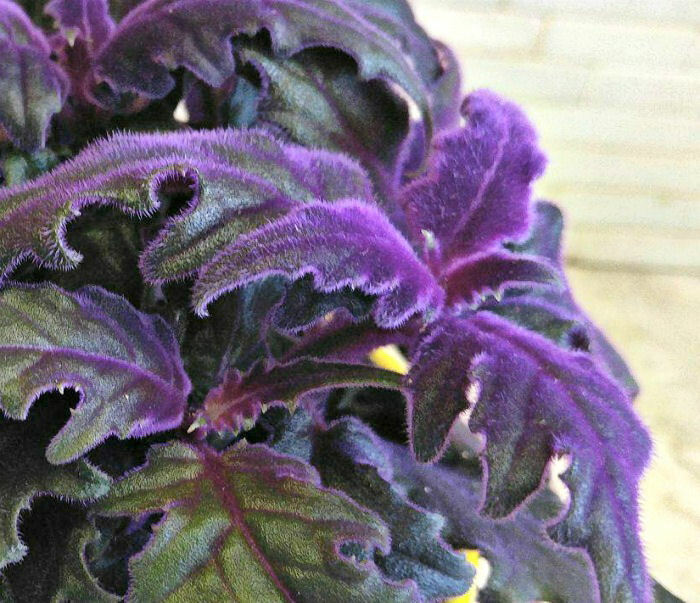 Purple Velvet plants likes a naturally humid environment, but doesn’t like to get water on the leaves themselves. Normally, I suggest misting the leaves to increase humidity but this would be a problem for this plant. A room humidifier, or placing the plant on a saucer of pebbles with water below the stone layer would help. Gynura Aurantiaca likes a relatively cool room. It does best if the temperature is between 60 and 70 degrees F.
The plant roots easily from stem cuttings. Just take a cutting about 2 inches long and remove the bottom leaves. Dip the tip into rooting powder and place in a seed starting mix such as perlite or vermiculite. The plant will soon develop roots and then you can re-pot it in normal potting soil. The cuttings will also root easily in water. 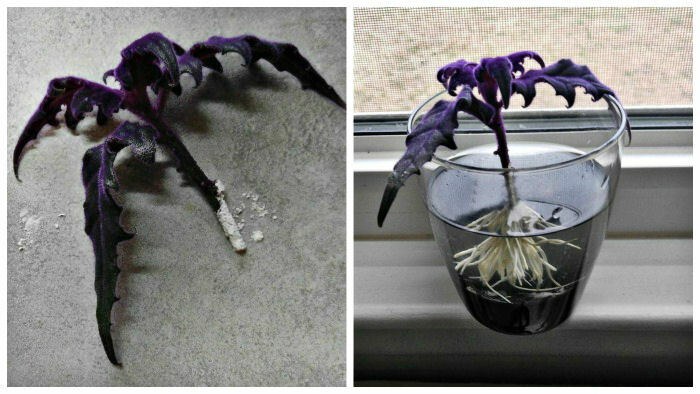 I have a whole tutorial on propagating purple passion plant from stem cuttings. You can check it out here. This houseplant stands out from other indoor plants because of the green leaves that are covered in soft purple hairs. The leaves also have a purple sheen that is attractive and looks a lot like velvet. The purpose of the hairs on the leaves is to protect the foliage from high light levels. It’s not hard to see where the common name velvet plant comes from is it? Be sure to keep water off the leaves in the same way that you would with African Violets, since this can cause the leaves to get soggy and they will rot. 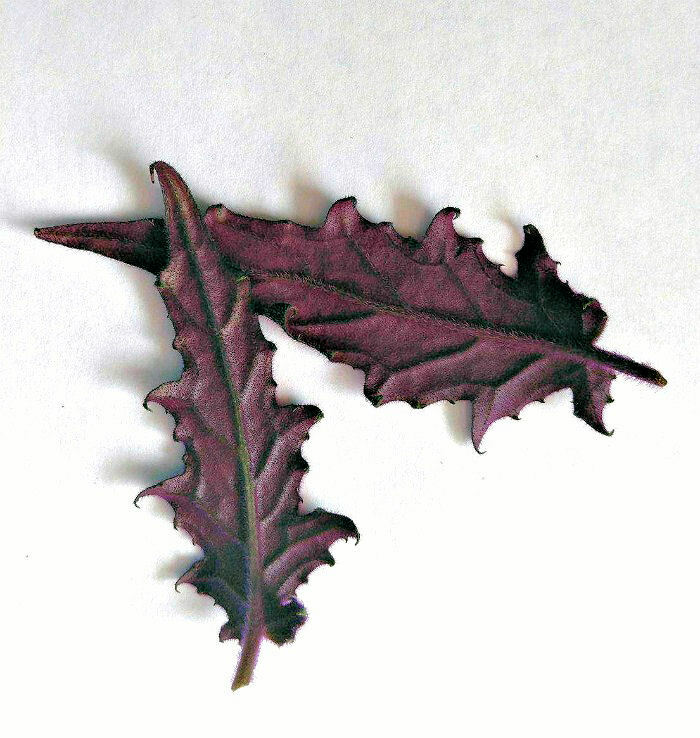 The underneath side of the leaf has a more even purple color than the top which is both green and purple. It is a plant that makes me think of fall, all the time! The flowers of gynura aurantiaca are a bright yellow color that look a bit like a dandelion flower. The aroma of the flower is not pleasant, so snipping them off will reduce the smell from the plant. If the plant starts to flower indoors, it normally means that it has reached maturity and it’s time to take cuttings for new plants. Since the plant is tropical and only hardy in zones 10-11, it is normally grown as a houseplant in the USA. Young plants make a nice table decoration and older plants with a more sprawling look do well in hanging baskets. It is not suitable for a closed terrarium since the humidity will be too high and the leaves can be affected. Open terrariums such as fish bowl styles can be use to showcase small plants as a focal plant. Mature plants with vining nature can also be trained to grow up trellises, wires, and other climbing structures. Older plants will lose much of their purple color as the plant branches out into vines. Pruning the tips often encourages more branches and more color of the leaves for longer. If your plant starts to lose its color, start over again with rooted cuttings. The plant can be grown as an annual outdoors, but be sure to contain it or the sprawling habit can take over a garden spot. You are more likely to see the flowers if you grow it outdoors. 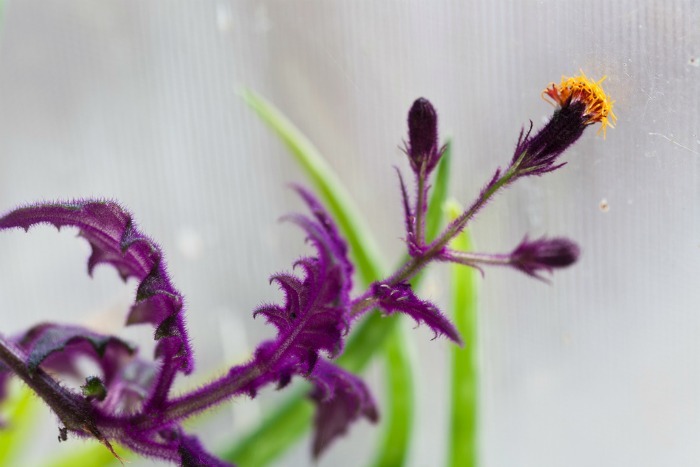 The plant is susceptible to attracting white flies, mealy bugs, spider mites, scale and aphids. The fleshy leaves are the source of the attraction. Isolate the plant if you find these pests and treat accordingly. Be sure to check the undersides of the leaves often. The plant is generally disease resistant, other than root root which is caused by over watering. If you want a splash of color to add to your indoor decor and don’t have a lot of light. Try growing Purple Passion plant. It adds a distinctive touch to any room. ← Harvesting Watermelons – When is a Watermelon Ready to Pick? Is it okay if this plant gets rain on it as I have it outside? 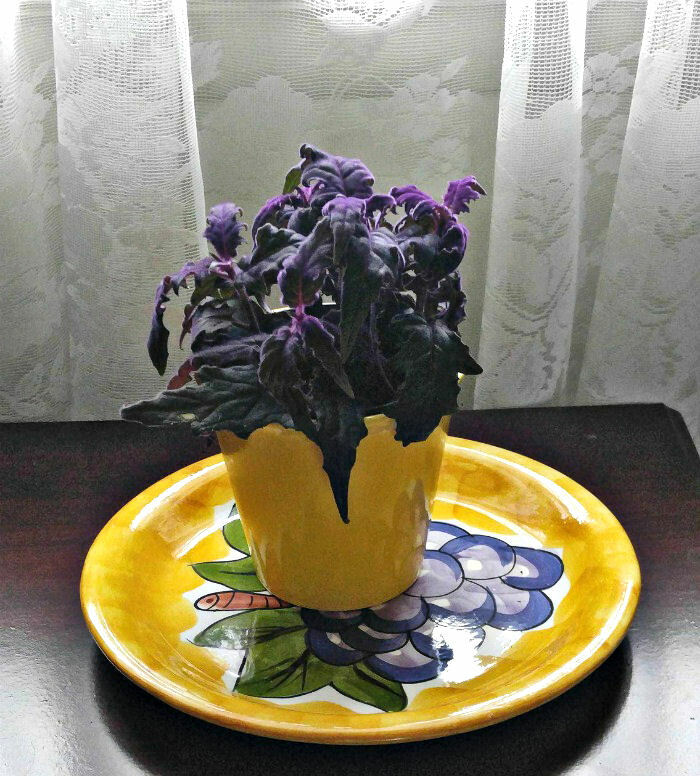 I recently got a purple passion & after repotting the leaves are now very droopy. I water only when the soil has dried out & I have it in a clay pot. The room it is in gets east/ south sun, but I dont have it right in the window, instead because of the low/ medium light preference I have it across the room on a dresser on a plant stand in front of a mirror. What am I doing wrong & how can I fix this? Thank You Carol. I have since sniped off the tips of 2 of the 3 stalks that was in the pot when I got it & placed them in a small vase to try & root. The remaining stem is now in a smaller pot with no water added. I figured out that they had way over watered prior to me buying it when I went to inspect it better this morning & the stems of 2 were squish & the tops came off in my hand 🙁 I also notice some root damage when I was moving the only remaining intact stem to the smaller pot. I did move it closer to the window hoping it will perk back up. I didn’t understand what the issue was because I had this plant a few years back & had No issues with it until we moved & then I lost most of my plants. So this one is my attempt at replacing the one I had & loved before. I have had several Purple Passions but recently find them being overtaken by aphids. how can i get ri of them safely and keep them under control?. My purple passion plant has little white spots , and i dont know what to do, i have tired soapy water but that is not working any thoughts ? Hi Ezra. There are special bulbs that you can get which will give natural sunlight conditions, but normal bulbs don’t do this. Even though the plant can take filtered sunlight, it still does need some natural light to flourish. I’d like to know where to buy one. I live in So. Calif. I had one years ago. Thanks. Hi Pam. I bought mine at either Lowe’s or Home Depot. Not sure where you would find one in So. Calif. They are pretty common though.